Designed in 4 level high, 5 linear blocks, the built spaces snake across a wedge shaped site twisting and turning along their length. Sitting adjacent to repetitive hostel blocks on the east and west these new hostels within a large university campus create individual spaces within a discernible identity in each part of the layout. 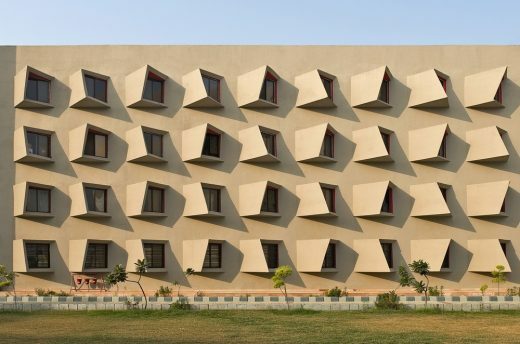 Situated on an undulating site in the deserts of Ras, Rajasthan, India, Studios 18 apartments are a part of an entire layout spread over 36 acres. With no buildings or development in the vicinity, this layout is being created for the working people of a new cement manufacturing plant that has commenced production nearby. Close to the site there is no existing development and there are four villages at a distance of 1 km from the site. Taking a cue from the organic layouts of the neighbouring villages near the site, the residential units are interspersed within the existing contours along organic streets that weave through the site. Sanjay Puri Architects (SPA), India, was the only firm globally to win three awards at MIPIM ARCHITECTURAL REVIEW Future Projects Awards 2013. Information for e-architect by ArchitectureLive! Sanjay creates Triose building in Lonavala – Angled spaces projected towards different directions encapsulated in an organically folded concrete skin create a two level building on this site in lonavala, a small city in India, housing a few retail shops, a food court, two restaurants, a large bar and an entertainment gaming area. Winner of Future Commercial Project Category for Reservoir, Rajasthan, India. Highly Commended in Sustainable Category for Studios 18, Rajasthan, India. October 29, 2017 in Architects.